Watercolour is one of the most exciting and enjoyable of all painting media. It is also a highly expressive and versatile medium. Just as a short poem can say more than a thousand words, a good watercolour is capable of capturing all the glories of nature, of light, sun and air and mist, with just a few brief strokes. It is the unique freshness and immediacy of watercolour that appeals to the artist and viewer alike. It is also the most challenging and unpredictable, and when a painting is unsuccessful it is often difficult to pinpoint exactly where things went wrong. However, "Darshana Chitra" methodically guides all young and adult interested in painting sceneries, in overcoming these difficulties to make painting an easy and enjoyable task and to become successful scenery painters. Nayanajith Premaratne, artist, author and teacher highlights guidelines that provide simple logical solutions that work. The book illustrates each problem with a typical beginner's painting and then demonstrates the pitfalls and solutions that should be applied as remedy. There are close-up details that reveal the artist's technique and a wealth of information offering many alternative colour solutions when doing typical scenery. Colour mixing in watercolour can be both fascinating and frustrating. Sometimes magical things happen, other times colours could turn muddy unexpectedly. The book deals with the practical problems involved and the solutions on how to control it totally. Once the reader grasps the theory and practices, he or she will be the master of the medium. The theories and solutions shown in the book are applicable to painting in any medium whether it be oil, watercolour, acrylic or pastel. The book covers a broad spectrum, from simple colour mixing to overcoming difficulties with composition, size and shapes. Special emphasis must be made of the 10 formulas that solve design problems and offers a wide colour coding variety to the artist. These 10 formulas could be described as absolute lifesavers in the choppy waters of scenery painting. Thus the main idea of the book is to make scenery painting an enjoyable task to all who are interested in the subject, and to dispel the belief that scenery painting is reserved to those who are more "talented" than others. The book proves that when armed with the proper knowledge, anybody with enthusiasm and plenty of practice "can do it". Apart from the practical business of mixing colour the book also looks at the creative use of colour in adding variety to the palette with a limited number of colours. The paintings and sketches illustrated are a welcome bonus. The practical details in colouring and simple use of brushes will probably earn the book a place on every shelf of a book seller. Nayanajith's zeal and passion for the task, combined with experience has provided an entrancing publication. For ease of reference the author has shown full colour step-by-step demonstrations on how to paint a wide range of subjects, houses, trees, different textures and light effects. Nayanajith has also shown is a unique work of art "Seevalee Maha Thera" by his grandfather, the famous early 20th century Buddhist revivalist painter Kala Guru M. Sarlis, and watercolour paintings and picture story illustrations done by his father Kala Booshana Susil Premaratne. Hopefully, finding these paintings inspiring one could use them as starting points for own creative solutions. The publication also serves as a worthy tribute to three giants of Sri Lankan art, Kaluguru M. Sarlis, who belong to the old masters, Kala Soori G. S. Fernando eminent water colourist and Kala Booshana Susil Premaratne the artist and musician and the author's father. These masters dedicated their lives to foster art in Sri Lanka and have been the teachers for me and Nayanajith. The book will serve as a lasting memorial of an artist's effort to the present and future generations which blazed and truly created waves in the sluggish back waters of art. 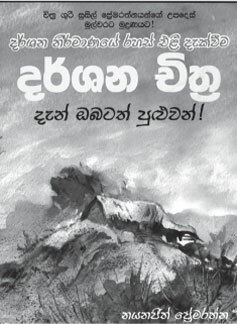 The book is available at Vijitha Yapa Bookshops, Sarasavi Book Shops and Thusitha Book Shop Ratmalana.